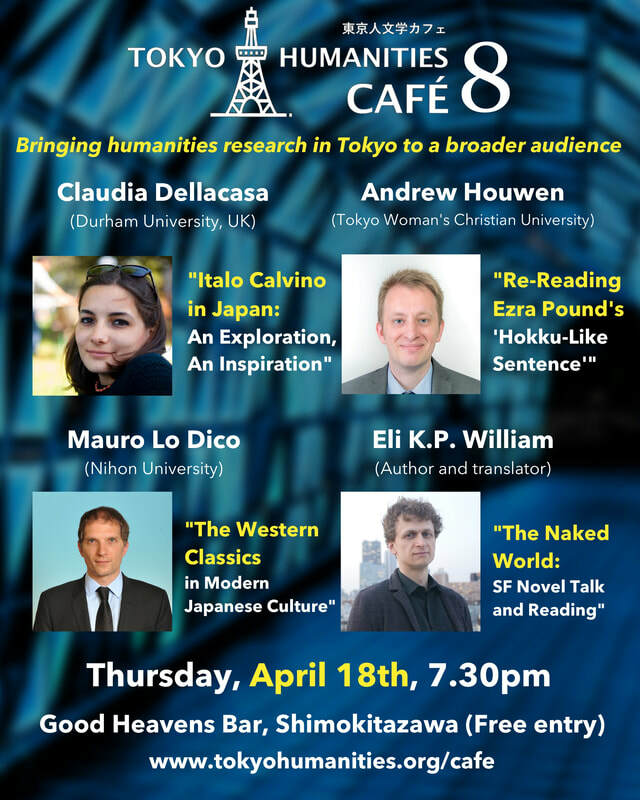 Tokyo Humanities Project is excited to announce the next in our series of English-language humanities cafés, organized by the Tokyo Humanities team and compèred by Alex Watson (Nagoya University). We invite a series of speakers - researchers, artists, translators, and others - to present their work in an informal, supportive, and lively atmosphere. The event aims to bring research outside the university to a broader audience, while providing a forum for people to meet and exchange ideas across traditional humanities disciplines. What is a "humanities café"? our popular cafe series at "Good Heavens" bar in Shimokitazawa. ​The talks are all pitched (TED-style) at a general audience - so no specialist knowledge is required. There'll also be plenty of time to relax with a drink and exchange ideas with other attendees. ​"Italo Calvino in Japan: An Exploration, An Inspiration"
Claudia Dellacasa is a PhD student at Durham University, UK. "Re-Reading Ezra Pound's 'Hokku-Like Sentence'"
Andrew Houwen is Associate Professor at Tokyo Woman's Christian University. ​"The Western Classics in Modern Japanese Culture"
Mauro Lo Dico is Associate Professor at Nihon University. ​"The Naked World: SF Novel Talk and Reading"
Eli K P William is author of The Car Crash Jubilee (Talos, 2015) and The Naked World (Talos, 2017).